The numbers are in and it’s official. This year was a record-breaker. 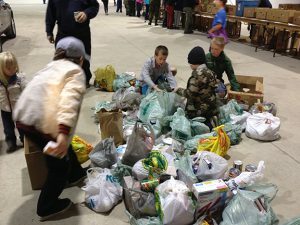 On the evening of October 3, more than 100 volunteers collected 15,000 pounds of food and more than $4,200 in cheques from thousands of Bracebridge residents. That’s up from 14,500 pounds of food and $2,500 in donations last year. <img class=”wp-image-1647 size-thumbnail” src=”http://mannafoodbank.ca/wp-content/uploads/2017/10/2017-10-03-19.28.35-150×150.jpg” alt=”Volunteers Maggie, Sydney and Mackenzie. Great job, girls!” width=”150″ height=”150″ /> Volunteers Maggie, Sydney and Mackenzie. Great job, girls! Manna President Sam Robinson’s thank you letter to the editor can be found <a href=”/2017/10/fall-food-drive-numbers-are-in/”>here</a>. You can also have a look at pictures from the evening <a href=”/2017/10/oldtimers-fall-food-drive-2017-in-pictures/”>here</a>. Or visit (and like) <a href=”https://www.facebook.com/mannabracebridge”>Manna’s Facebook</a> page, where you can add your own. Thanks again, folks! As Sam always says, we couldn’t do it without you! You can now donate to Manna online though Canada Helps or PayPal. Just click the logos below to get started. You can make a single donation or Make it Monthly. Thank you! The Manna Food Bank is a Bracebridge-based volunteer-run charitable organization whose mandate is to ensure that the immediate needs of the hungry are met. For more, visit our ABOUT US page. Thank you for supporting Manna. We gratefully acknowledge the ongoing support of Aspire Muskoka.